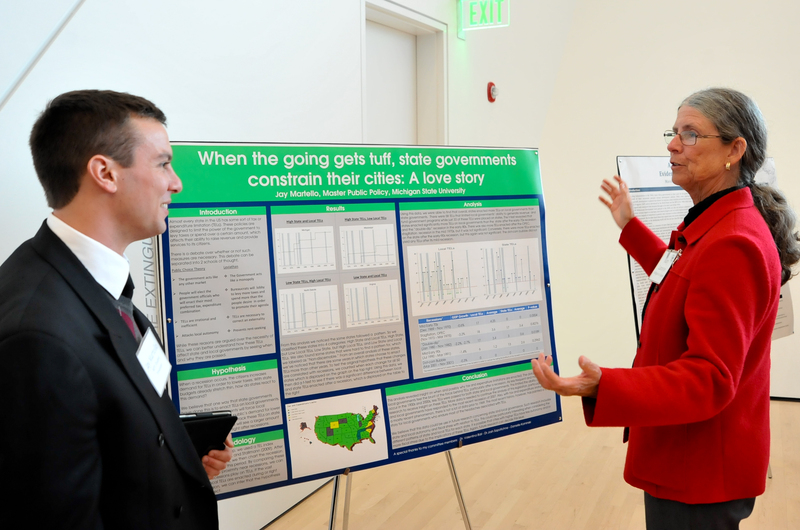 Mary Lannoye, attending the 2014 MPP Capstone Forum Event. Mary Lannoye (MPA ’81) has had a long, successful career working in both state and county government. She has held high-profile positions with the counties of Ingham and Wayne and served as State Budget Director to Governors Engler and Granholm, and Chief of Staff to Governor Granholm. Throughout her career she has balanced practical considerations with political limitations to produce solutions to budgetary problems. With an interest in politics and an academic background in mathematics, Lannoye had the aptitude for budgeting. While in the MPA program, Lannoye was placed as an intern with Ingham County. This internship gave her the opportunity to gain practical experience in budgeting, which would prove to be essential to her for the rest of her career. A year into the program, her supervisor at Ingham County left and Lannoye was offered the position. Lannoye stayed with Ingham County for the next 7 years, working in finance, animal control, county medical care, the prosecutor’s office, and finally attaining the position of Deputy Controller. From there, Lannoye went on to become the Budget Director for Wayne County where she worked on the team to resolve the accumulated and structural general fund deficit for the county. The team successfully balanced the long- and short-term budgets due to a deal with the State, in which the State of Michigan raised the cigarette tax and pledged the annual proceeds to pay the County’s debt to the state and a deficit reduction bond. Lannoye transitioned to the Michigan Department of Public Health as Chief of the Bureau of Financial and Administrative Services. After four years Lannoye moved to the State Budget Office. In 1998 Governor Engler appointed her Budget Director. Near the end of Governor Engler’s term she took a position as a consultant with Health Management Associates. She returned to state government after being appointed as Budget Director by Governor Granholm and immediately had to balance a $1.8 billion shortfall. After four years, Lannoye became Governor Granholm’s Chief of Staff. Mary Lannoye retired as the Ingham County Controller, returning back to the place where she began her career. As County Controller, Lannoye balanced the budget and with the Board of Commissioners support instituted a long-term plan to fund the County’s legacy costs. Since retiring, Lannoye has worked as a consultant focusing mainly on the transition of the Detroit Health Department.